The problem is that these compilers don’t know that an exit from main is the same as a return. One way around these warnings, which become annoying after a while, is to use return instead of exit from main. But doing this prevents us from using the UNIX System’s grep utility to locate all calls to exit from a program. Another solution is to declare main as returning void, instead of int, and continue calling exit. This gets rid of the compiler warning but doesn’t look right (especially in a programming text), and can generate other compiler warnings, since the return type of main is supposed to be a signed integer. The empty list in a function declarator that is not part of a definition of that function specifies that no information about the number or types of theparameters is supplied. or equivalent;or in some other implementation-defined manner. If status is zero or EXIT_SUCCESS, an implementation-defined form of the status successful termination is returned. If the return type of the main function is a type compatible with int, a return from the initial call to the main function is equivalent to calling the exit function with the value returned by the main function as its argument;reaching the } that terminates the main function returns a value of 0. If the return type is not compatible with int, the termination status returned to the host environment is unspecified. Forward references: definition of terms (ISO/IEC 9899:201x 7.1.1), the exit function (ISO/IEC 9899:201x 7.22.4.4). the caller, the behavior is undefined. The exit function causes normal program termination to occur. If more than one call to the exit function is executed by a program, the behavior is undefined. First, all functions registered by the atexit function are called, in the reverse order of their registration,except that a function is called after any previously registered functions that had already been called at the time it was registered. If, during the call to any such function, a call to the longjmp function is made that would terminate the call to the registered function, the behavior is undefined. Next, all open streams with unwritten buffered data are ﬂushed, all open streams are closed, and all files created by the tmpfile function are removed. The exit function cannot return to its caller. 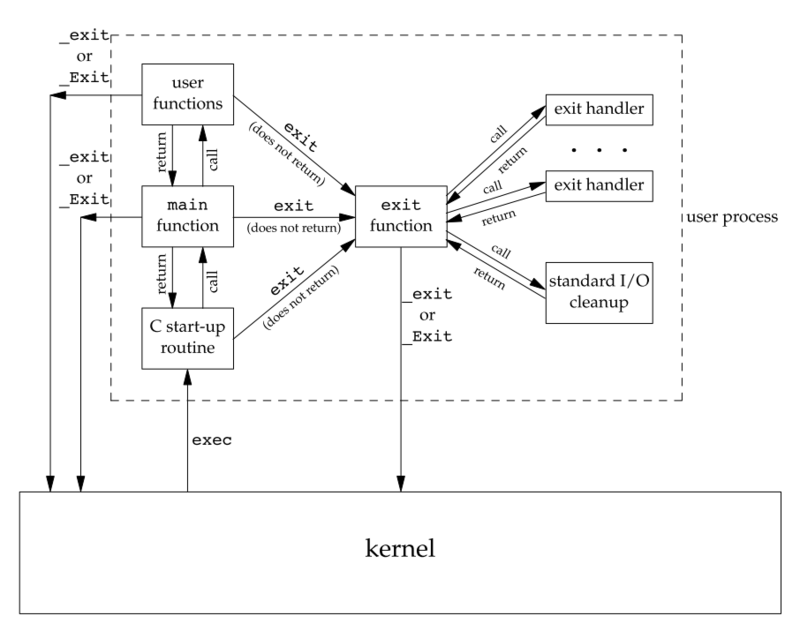 The _Exit function causes normal program termination to occur and control to be returned to the host environment. No functions registered by the atexit function or signal handlers registered by the signal function are called. The status returned to the host environment is determined in the same way as for the exit function (7.20.4.3).Whether open streams with unwritten buffered data are ﬂushed, open streams are closed,or temporary files are removed is implementation-defined. The _Exit function cannot return to its caller. Modifying an object between two sequence points more than once produces undefined behavior. It is worth mentioning that there are considerable changes in what causes undefined behavior in relation to sequence points as of C++11. The following example will however cause undefined behavior in both C++ and C.
When modifying an object between two sequence points, reading the value of the object for any other purpose than determining the value to be stored is also undefined behavior. Documenting an operation as undefined behavior allows compilers to assume that this operation will never happen in a conforming program. This gives the compiler more information about the code and this information can lead to more optimization opportunities. Had the compiler been forced to assume that signed integer overflow has wraparound behavior, then the transformation above would not have been legal. Such optimizations become hard to spot by humans when the code is more complex and other optimizations, like inlining, take place. Another benefit from allowing signed integer overflow to be undefined is that it makes it possible to store and manipulate a variable’s value in a processor register that is larger than the size of the variable in the source code. For example, if the type of a variable as specified in the source code is narrower than the native register width (such as “int on a 64-bit machine, a common scenario), then the compiler can safely use a signed 64-bit integer for the variable in the machine code it produces, without changing the defined behavior of the code. If the behavior of a 32-bit integer under overflow conditions was depended upon by the program, then a compiler would have to insert additional logic when compiling for a 64-bit machine, because the overflow behavior of most machine code instructions depends on the register width. A further important benefit of undefined signed integer overflow is that it enables, though does not require, such erroneous overflows to be detected at compile-time or by static program analysis, or by run-time checks such as the Clang and GCC sanitizers and valgrind; if such overflow was defined with a valid semantics such as wrap-around then compile-time checks would not be possible. 允许有符号整数溢出未定义的另一个好处是可以在处理器寄存器中存储和操作变量的值，该寄存器的值大于源代码中变量的大小。例如，如果源代码中指定的变量类型比本地寄存器宽度窄（例如64位机器上的“ int ” ，这是最常见的情况），那么编译器可以安全地使用带符号的 64 位寄存器 机器代码中产生的整数变量，而不会改变代码的定义行为。如果在溢出条件下32位整数的行为被程序所依赖，那么在编译64位机器时，编译器将不得不考虑额外的逻辑，因为大多数机器代码指令的溢出行为取决于寄存器宽度. C and C++ standards have several forms of undefined behavior throughout, which offers increased liberty in compiler implementations and compile-time checks at the expense of undefined run-time behavior if present. In particular, there is an appendix section dedicated to a non-exhaustive listing of common sources of undefined behavior in C. Moreoever, compilers are not required to diagnose code that relies on undefined behavior, due to current static analysis limitations. Hence, it is common for programmers, even experienced ones, to unintentionally rely on undefined behavior either by mistake, or simply because they are not well-versed in the rules of the language that can span over hundreds of pages. This can result in bugs that are exposed when optimizations are enabled on the compiler, or when a compiler of a different vendor or version is used. Testing or fuzzing with dynamic undefined behavior checks enabled, e.g. the Clang sanitizers, can help to catch undefined behavior not diagnosed by the compiler or static analyzers. In scenarios where security is critical, undefined behavior can lead to security vulnerabilities in software. When GCC’s developers changed their compiler in 2008 such that it omitted certain overflow checks that relied on undefined behavior, CERT issued a warning against the newer versions of the compiler. Linux Weekly News pointed out that the same behavior was observed in PathScale C, Microsoft Visual C++ 2005 and several other compilers; the warning was later amended to warn about various compilers. 在安全性至关重要的情况下，未定义的行为会导致软件中出现安全漏洞。GCC的开发人员在2008年修改了他们的编译器，忽略了某些依赖于未定义行为的溢出检查时，CERT会对新版本的编译器发出警告。 Linux Weekly News 指出，同样的行为存在于 PathScale C, Microsoft Visual C++ 2005和其他一些编译器; 警告规则在后来已经被修订，用来警告各种编译器. “Vulnerability Note VU#162289 — gcc silently discards some wraparound checks”. Vulnerability Notes Database. CERT. 4 April 2008. Archived from the original on 9 April 2014. “Order of evaluation – cppreference.com”. en.cppreference.com. Retrieved 2016-08-09. Undefined behavior can result in time travel. 27 Jun 2014 [2015-03-09]. Lattner, Chris. What Every C Programmer Should Know About Undefined Behavior. LLVM Project Blog. LLVM.org. May 13, 2011 [May 24, 2011].